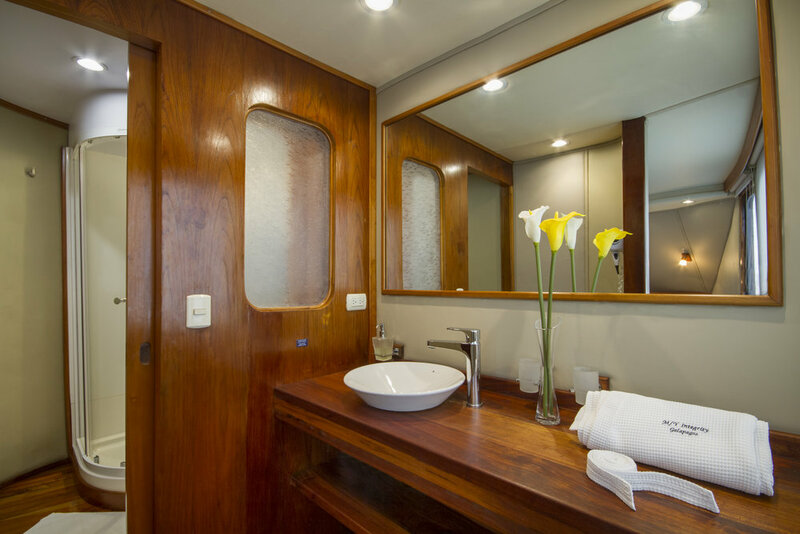 The Owner’s Suite aboard INTEGRITY spans the full width of the yacht and is the pinnacle of comfort and spaciousness. The Owner’s Suite (Stateroom #1) spans the full width of the main deck with large picture windows on both sides of the stateroom. It measures 350 ft² with ample storage and a generously sized en suite bathroom, featuring a walk-in rain shower, large Cedrela hardwood vanity and porcelain vessel sink. Your suite offers the opportunity to relax in unparalleled comfort , savoring the spectacular views of Darwin’s islands on either side of the suite.